While small populations of wild elephants may be found in the mountains along the Myanmar border and in fragmented forest areas on the southern peninsula, visiting captive facilities is the easiest and most popular way to see elephants in Thailand. 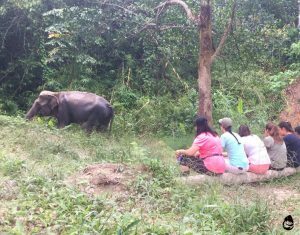 Travel agencies, hotels, and Thai based tour operators will entice tourists to visit elephant ‘camps’, see shows, or take an elephant back ride, called trekking. Most of the elephants involved in these types of activities do not receive proper care and are suffering physically and mentally. Please see our section on Elephant Tourism. There is also a new type of elephant activity called ‘Mahout Training’ where tourists are taught how to mount and ride an elephant on the bare neck. Elemotion Foundation prefers captive elephants to have the most natural existence possible, without giving rides, so we do not recommend mahout training. However, Thailand does offer a few places where the elephants needs are put above tourist entertainment. Please consider visiting or supporting the following recommended elephant friendly programs and organizations in Thailand. Our list is in alphabetical order. When sanctuary founder Katherine Connor lost the battle to save the life of a special baby elephant named Boon Lott, she continued her fight for elephant welfare by founding a non-profit sanctuary in his name. Located one hour’s drive from Sukhothai, Boon Lott’s Elephant Sanctuary (BLES) is one of Thailand’s few true elephant sanctuaries. BLES offers sick, injured, and abused elephants a chance to heal their physical and psychological wounds so they may live happily in their natural environment. After a personal pick-up from the local bus depot, train station, or airport, you will be welcomed into the BLES family of mahouts, staff, dogs, cats, and 13 elephants. Only three guesthouses guarantees that there are always more elephants than guests. The mahouts, who do not use hooks, stand watch over the elephants as they play in the pond or wander into the forest. You will witness the elephants’ true spirits as you observe them from a short distance. But just in case, be prepared if an elephant decides to come closer and say hello. A special observation platform at the bathing pond and daily walks into the forest will provide you with plenty of time to ask questions, take pictures, and get to know the elephants. Expect to leave BLES feeling like you have become a part of a very special family. Read Elemotion’s interview with Katherine Conner, BLES’s founder, about the Star Medical Clinic. Nestled in Mae Cheam Valley, about two and half hours drive southwest of Chiang Mai, you’ll discover a very special place called Burm and Emily’s Elephant Sanctuary (BEES). 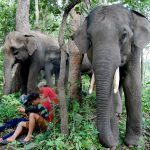 Founded by Australian, Emily McWilliam, and local Thai, Pornchai Rinkaew (Burm), BEES is a family and community based project providing a loving home for old, injured, and retired elephants. BEES puts their elephants’ wellbeing first, and their mahouts do not carry hooks. BEES’ three lucky elephants, Thong Dee, Mae Kam, and Mae Mor no longer have to suffer the hardship of working in logging or tourism. These ladies can finally retire and enjoy freedom in a caring and natural environment. After booking in advance, pick up can be arranged for you in Chiang Mai on Mondays and Thursdays. For your authentic Thai experience, accommodations include four rustic but comfortable onsite guestrooms and 4 village homestay rooms. Elephant activities include washing, walking, preparing food, feeding, and observing the elephants’ charismatic behaviors. Participation in conservation, environmental, and community projects are also possible. Average guest volume is 3 to 7 people, so you will be able to enjoy the elephants, and the elephants are never overwhelmed. BEES is one of Thailand’s few true elephant sanctuaries, a place to reconnect with nature, and gain memorable insight into the lives of elephants. Kindred Spirit Elephant Sanctuary (KSES) is dedicated to giving their elephants the most natural life possible in the forests of Mae Chaem Valley – a district of Chiang Mai Province in northern Thailand. Started in the summer of 2016 by Kerri and Sombat, KSES is a registered Thai non-for-profit organization. The sanctuary currently has four elephants and welcomes tourists, volunteers, interns, and students for short or long term stays. The sanctuary elephants do not work. Several are family members, reinforcing natural herd formation. They spend 12-hour days free in the forest under the watchful eye of their Karen mahouts. At night they remain in the forest tethered on long chains for their safety. This type of tethering is a common practice. However, the sanctuary is looking into alternatives to the night chains so the elephants may live chain free 24/7. The exceptional amount of freedom lets the elephants express their free will, socialize, free forage, bathe in local streams, and just enjoy being elephants. KSES excels in replicating wild living as much as possible, resulting in happier, healthier animals. Visitors to the sanctuary will be delighted to witness the natural behaviors of these sanctuary elephants in a natural setting. Photos and feeding are allowed at times. Visitors must be fit, able to trek into the forest, and like more rustic conditions. The staff will arrange for a pick-up and drop-off from Chiang Mai. 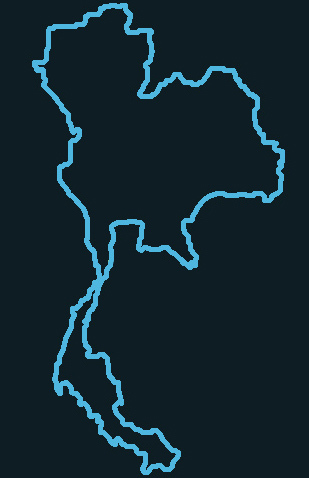 The drive to the sanctuary is around four hours. Please contact the sanctuary if you have questions about conditions, accommodations, or transport. For tourists enjoying the beaches of Phuket and still wanting a responsible way to see Asian elephants, Phuket Elephant Sanctuary is the place to go. Working elephant camps, shows, and safari’s in southern Thailand are notorious for abusive practices, neglect, illegal trafficking, and animal exploitation. Phuket Elephant Sanctuary is not only an elephant-friendly alternative, but it is a model for progressive change and improved welfare standards in the south. Phuket Elephant Sanctuary, a collaboration between Mr. Montri Todtane, Save Elephant Foundation and EARS Asia Foundation, opened in 2016. The sanctuary is currently home to four rescued elephants. Having previously worked in logging and tourism camps, the elephants are in need of rehabilitation and rest. The sanctuary gives them a safe place to heal, make friends, and just enjoy being elephants. Particular attention and medical care is provided to elephants with disabilities and special needs. Each elephant is assigned a caring, watchful mahout who expertly guides his elephant without the use of the bullhook. The location in Paklok (25min from Phuket International Airport) allows the elephants to enjoy a quiet forest, while still being easy to reach for visitors. Observing the relaxed elephants in their natural habitat, visitors will witness behaviors such as foraging, swimming, playing, and mud bathes. Hear the adorable squeaks and vocalizations made only by Asian elephants. Learn more about the elephants with the sanctuary’s video, guided tour, individual elephant backgrounds, and observation platform. Interactive activities include feeding, photos, and walking with the elephants. There are no onsite accommodations, so visitors may stay nearby or organize transport from their hotel to the sanctuary. Day tours can be booked online through the website. 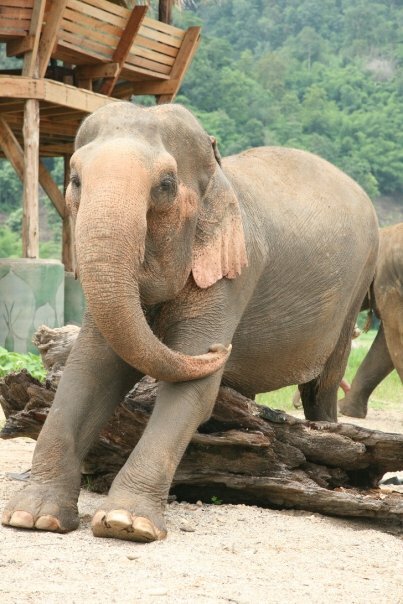 Located about an hour’s drive north of Chiang Mai, Elephant Nature Park (ENP) is founded and run by Time Magazine’s Asian Hero 2005, Sangduen ‘Lek’ Chailert. The park’s 30+ elephants can be easily seen roaming and socializing in the vast open grounds. After pick-up and transport from your hotel, you will be guided through your day. It will include feeding the elephants from a platform, bathing them in the river, watching a documentary, eating an amazing lunch, and hearing many touching stories about the elephants’ individual backgrounds, injuries, and rescues. Elemotion Foundation does not consider ENP to be a sanctuary. (Learn about sanctuaries here.) As it’s name suggests, it is a ‘park’. While the elephants do not do regular tourism ‘work’ at the park (such as riding or shows), Elemotion Foundation is apprehensive about the park’s high level of elephant-tourist interaction. The average number of guests per day is around 100. Even so, the elephants interacting with visitors are guided through the day’s schedule, without the use of hooks, by their personal mahout. The park has also added more night stalls allowing many of the elephants to spend their nights chain-free. Most visitors leave the park having fallen in love with a favorite elephant and having learned more about the Thai elephant’s situation. If you are visiting Chiang Mai, cannot make it to a sanctuary but would still like to have an elephant experience, Elephant Nature Park is a good option. Day, overnight, and volunteer experiences are possible. 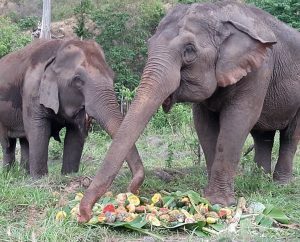 Elephant Nature Park also runs several other projects; notably the Surin Project and a new elephant sanctuary in Phuket. Visit their website to choose the project best for you. Read Elemotion Foundation’s interview with Khun Sangduen ‘Lek’ Chailert, founder of Elephant Nature Park. Opened in December 2016, Elephant Valley Thailand (EVT) is an extraordinary example of a true, elephant-friendly sanctuary. Director Jack Highwood developed his exceptional sanctuary model at his first project, Elephant Valley Project (Cambodia). With EVT, he has brought his years of experience and the highest ethical welfare standards to Thailand. EVT is currently the first and only true elephant sanctuary in Chiang Rai, Thailand. EVT’s six very lucky elephants formerly worked in logging, performing, and riding. Under the watchful eyes of their caring mahouts, the elephants now roam 40 acres of forested land, expressing their own free will and enjoying just being elephants again. Restricted tourist-elephant interaction keeps the elephants at ease and allows guests to witness the elephants’ unique natural behaviors. During visits, guests can expect to see the elephants playing, bathing, free foraging, and socializing. Visitors will get to know each elephant’s story, learn about elephant care, and have plenty of extra time for elephant watching and photos. Not only does EVT make the elephants’ well-being a top priority, EVT’s high ethical and environmental standards ensures the mahouts and staff are respected, land is carefully used for a self-sustaining operation, and guests partake in a real responsible tourism experience. 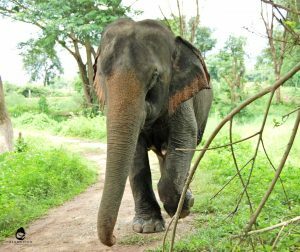 Read Elemotion Foundation’s 2012 interview with Jack Highwood , about his first sanctuary, Elephant Valley Project Cambodia.